YEARONE Blog Updates: YearOne and American Trucker Head to Texarkana! YearOne and American Trucker Head to Texarkana! In the iconic movie Smokey and the Bandit, Burt Reynolds and Jerry Reed make a mad dash to Texarkana, Texas from Atlanta to pick up a truck load of Coors. Some three decades later, YearOne teamed up with the American Trucker TV series to recreate that special trip - in less than 28 hours of course. 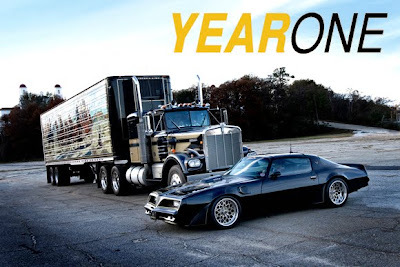 And to make the trip even more memorable, YearOne supplied a 600-hp Burt Reynolds Edition Trans Am, and American Trucker managed to find a recreation of the Snowman's famous Kenworth! Be sure to tune in to episode three to see YearOne and American Trucker make the trip they said couldn't be done! American Trucker (Thursdays at 10 and 10:30 p.m. ET, two 30-minute episodes) – Produced by BCII Productions (Overhaulin’, Rides, Livin’ the Low Life, Payback, Hot Rod TV, Car Crazy) and hosted by designer/artist and fanatical truck expert Robb Mariani, American Trucker introduces the audience to iconic trucks, the famous routes they followed and the cargo missions that made history. These aren’t fabricated stories of drama and danger…no, these are real stories of authentic big rigs and their drivers that are truly the backbone of the American economy. Robb is building a replica WT9000 Ford “Blue Mule” in homage to the 1975 film “White Line Fever “ with the help of his friends at Bill’s Truck Service in Orlando, FL. To get there, Robb hops a ride with the support semis trekking over land to bring cars, trucks and supplies to the famous Baja 1000 off-road race. Paul Sagehorn is an American Trucker. Paul grew up watching BJ & The Bear on 1970’s television. Like many, he dreamt about one day driving that same movie big rig. Decades passed – Paul tracked down the truck he idolized from his childhood and bought them. Soon he will be driving his BJ & The Bear big rig to the very factory that custom built the truck for the NBC TV Series some 32 years ago. Holding off Star Wars for 3 months at the box office in 1977 says something about a film. Smokey and The Bandit did just that. Burt Reynolds was Bandit driving the Tran Am. The Snowman was Jerry Reed driving the famous big rig. In this episode of American Trucker we meet Brad Wike of NC. Brad has built a stunning tribute truck (including a hand painted trailer) of the Snowman’s big rig. Robb’s off to South Carolina to meet up with Kelvin Locklear, owner of K&L Chrome Shop and Outcast Kustoms. Kelvin has been customizing a 1983 Peterbilt 362 cabover rig for Neivel Williams, an active Special Forces soldier stationed at Fort Bragg. Neivel’s father bought the truck back in 1980 and after driving it for decades, gave it to his son. Robb learns more about the truck’s family history and what Neivel has gone through in order to get the truck to the shop. Before I could walk, my parents had a motor home and would take me and my brothers and sisters all over the USA during the late 60’s – mid 80’s. My earliest memories were of being on the US Interstates and seeing all the “golden era” big rigs on the road - not to mention seeing them parked at the truck stops. Something struck a chord deep in my soul. The trucks were so unique. Each one was different from the next and seemed to take on an identity of power and freedom. Each truck driver I would see was like seeing a super hero – their rig was their super power. I began drawing at a very early age - somewhere around 4. I developed an inclination for pleasing an audience through artistic expression, and drawing diesel trucks was always my first choice, namely because it was all I had on my mind. Needless to say, my plans for becoming a trucker took an exit. I followed my art skills and made it my career, but never lost my fervor for American big rigs. With the advent of the internet, I found myself scouring every site or chat room in search of my favorite trucker films, truck pictures, truck stories, trucker items – you name it, I went after it! But then I decided that the pictures and information were no longer enough. Considering that I loved the movie White Line Fever from 1975 and the “Blue Mule” Ford cab-over that co-starred along with Jan Michael Vincent, I set my sights on finding that movie truck, or one just like it. Why? I was not a trucker, I did not own a trucking company, but it did not matter - I needed a Ford W Series big rig! Years went by and I found one for sale in Tennessee and bought it! I’m a renaissance man for the golden era of American Trucking. Old trucks sitting in a field once played a vital role in the lives of American families. The stories of the truckers that maintained the trucks mile after mile go on and on…the stories of the American Trucker.